What terrors lurk in Grizzly Eye Cave? The locals call it Grizzly Eye Cave because it doesn’t take much imagination to see the small hill it is in as the head of a bear when coming towards it from the south along the Glohs Tributary. It is a bit of a tight fit to get into the cave initially, but over the ages it has seen a lot of use both by animals and locals both because of the very defensible entrance tunnel and the freshwater stream that runs through the cave below. 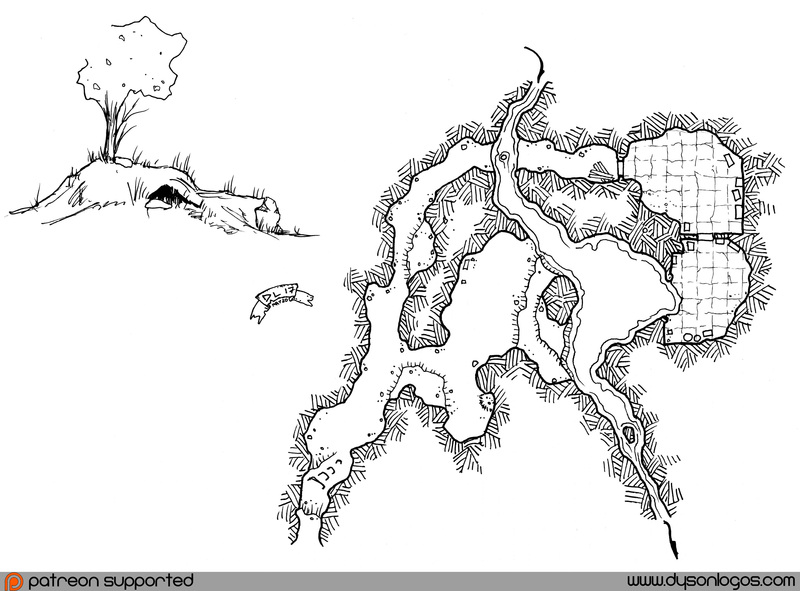 At one time a significant amount of (magical) work was put into upgrading one part of the cave as a sorcerer’s retreat that was then repurposed into place where local teens would hide trinkets and stolen goods. But something slithered into the cave about a decade ago, terrified a few of the local boys, and rarely comes out. A long lean serpentine beast that keeps its wings tightly wrapped to its body, the dragon that resides in Grizzly Eye Cave now will be a surprise to most who would challenge the beast. A slick-haired dragon almost like an otter – it leaves hair and spoor by the entrance of the cave when it slips in and out late at night. In game terms it would be an adult green dragon with it’s breath weapon a line of foul venom (same dimensions as the black dragon breath, same effects as the green dragon breath) that it spews, reduce the wing attack damage by half, but add the ability to get a free grapple attack with the tail attack, and have it coiled around the big column by the underground river, attacking from one side while it’s tail attacks from the other side. And looking more than a bit otterlike, it should come as no surprise that when dangerously challenged, it escapes by swimming downstream into the dark crevices of the earth.